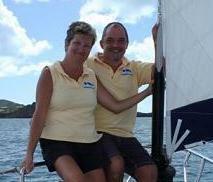 Founded in 2000 Jabberwocky has been doing Day Charters in and around Antigua for 10 years. Thousands of guests, sailors and non sailors alike, from 6 months to 93 years of age have experienced the thrill of sailing aboard Jabberwocky in Antigua. For many a day aboard Jabberwocky has simply been "the best day of the holiday..........."